On October 14, a Black Bear cub was admitted to the Wildlife Center from Shenandoah County. The bear had been seen hanging out in the same general area for about a week; a citizen noted on October 14 that the bear had blood coming from its mouth and was not moving much. A conservation police officer responded to the scene and was able to capture the injured cub and transport it to the Wildlife Center. Dr. Karra, the Center's veterinary intern, examined the male cub when he arrived. The bear was bright, alert and feisty and was difficult to restrain. The team anesthetized the cub for a full exam and found that the bear had a mandibular (lower jaw) fracture. Dr. Karra noted that the fracture was right in front of his deciduous (baby) teeth; she could see the bear's adult canine teeth growing in underneath through the fracture line. The jaw fracture had a moderate amount of hemorrhage but appeared to be fresh and clean. Dr. Karra gave the bear pain medication and fluids and allowed him to recover in a zinger crate in the Center's holding room. On October 15, additional radiographs of the head and jaw were taken to more precisely see the jaw fracture. The bear will be taken to surgery on Tuesday, October 16; Drs. Ernesto and Karra will place wire through the two sections of the fractured jaw to stabilize it. While the veterinary team feels they can fix the fracture, the bear's prognosis is guarded; the type of open fracture is susceptible to infection and additional complications. The veterinarians will also need to monitor the viability of the cub's adult canine teeth -- not only during surgery but also in the months ahead. Your donation will help provide veterinary medical care to this injured Black Bear cub -- and more than 3,000 patients admitted this year. Please help! On Thursday, Dr. Ernesto did a full work-up on bear #18-2926, who was admitted in October 2018 with a broken elbow. While the bear’s fractured leg was surgically repaired last fall, the team knew that this would be a very difficult fracture to overcome, particularly in a young, growing bear. The yearling has been in the Bear Complex since early January, and the rehabilitation team has been monitoring the bear carefully; the bear has had no issues climbing trees, though the team has noted that the bear doesn’t walk completely normally. Radiographs confirmed that the fracture site is stable; Dr. Ernesto was pleased with how this appeared and decided that the bear could be released without additional concern. 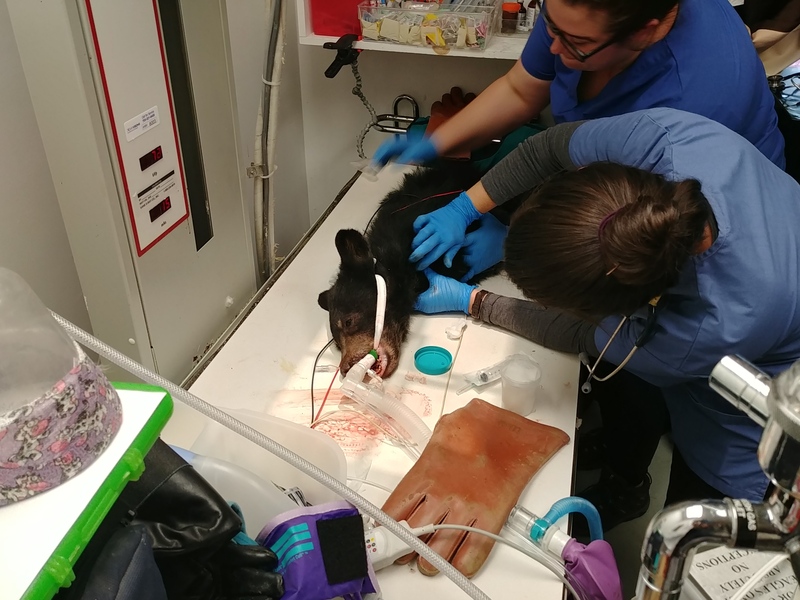 However, the yearling bear also had a wound on her face; upon closer examination, Dr. Ernesto realized that the wound was caused by a tooth root abscess. The bear’s tooth will need to be extracted before release; the bear was placed in the Center’s Bear Pen while options are being considered. The six yearlings in yard #1 are all doing well. Each of these bears arrived this past fall or winter; many were underweight, and some tested positive for mange mites. At this point, they are all in good body condition and each has resolved its initial injuries or issues; while these bears aren’t as large as the bears in yard #3 [who have been at the Center since spring 2018], the yard #1 yearlings are healthy and ready to be returned to the wild. Since these bears are generally more wary of people, and several enjoy spending their days in trees, the rehabilitation staff will set live traps in yard #1 in hopes of catching some of these bears early in preparation for release. Once trapped, the bears will be moved to the Large Mammal Isolation enclosure, where they can be more easily and safely darted and anesthetized on their release days next week. Trapping will start Wednesday; the Critter Cam for this yard will cease streaming at that time. Once the yearlings are anesthetized next week for their final examinations, they’ll be weighed and ear tagged for release. Bears that were admitted to the Center as cubs (“young of the year”) will have green release ear tags; bears that were admitted as yearlings (after Jan 1 of the year following their birth) will wear yellow ear tags. Black Bear cub #18-2921 [Green/Orange Tags aka “jaw bear”] was moved to the transition area of yard #1 in the Black Bear Complex today. The bear was extremely difficult to dart and anesthetize, and, in the end, the team shifted the bear into a Zinger crate. The crate was transported to the Bear Complex, and the cub was put in the transition area with Black Bear #18-2926 [Pink/Orange Tags]. The two bears on the other side of the Large Mammal Isolation enclosure – Red/White Tags and Orange/Yellow Tags – were also moved to the Bear Complex today. Those bears are currently in the main area of yard #1; the connecting door will likely be opened on January 4, giving the four bears access to all of yard #1. “The bear was sedated in his enclosure and we then brought him down to the clinic for an examination and radiographs. The bear was hesitant to fall asleep with our drugs, but with a few doses went down uneventfully. “The physical exam showed the jaw fracture is still very stable. The bear is in great body condition and has gained 2.0 kg since the last examination (two weeks ago). The previously noted region of bony proliferation on the jaw with a soft center -- thought to be a possible infection – has greatly improved. A physical exam and radiographs confirmed that the soft ‘center’ of this lesion (the area suspected to be an abscess/infection) is filling in with bone, which is great news, as this will make the jaw stronger and means whatever material was in there is going away. “The bear’s two lower deciduous (‘baby’) canine teeth were noted to be very loose, which is a good sign that the adult canines underneath are coming in. They were both so loose that we just removed them during the exam. Blood was collected for a routine CBC (complete blood count) and chemistry. We will continue to feed the bear a soft meal for another two weeks to ensure that jaw fracture remains stable and to allow area of lysis to further fill in with bone; after that, the bear should be able to fed normally. On November 10, wildlife rehabilitator Kelsey noted that the external fixator (the wires and bar used to repair the bear’s jaw), were no longer on bear cub #18-2921. She notified Dr. Karra, and they decided to fast the bear so that he could be sedated the next day for evaluation. On Sunday, Jess and Dr. Karra sedated the bear, then brought him down to the clinic for radiographs and further evaluation. On physical exam Dr. Karra was able to confirm that even though the external fixator was no longer attached to the bear, the bear’s fracture was very stable on palpation and appears to have healed very well. Dr. Karra reports, “We did, however, note a large boney swelling farther back along the jaw, away from the fracture, with a soft center. Radiographs were performed and these showed that this swelling is in fact bone, with a soft core. We suspect this is a bone infection with some purulent material in the middle. I was able to use a large needle to sample the center of the swelling so that we can send the material for culture and sensitivity. The samples will go to the lab, where they will try and grow whatever bacteria is causing this infection, and then test what antibiotics are most effective for that specific bug. “On the radiographs, we could also see that the jaw fracture had healed well and that the teeth involved with the fracture site appear to be vital and growing! This is great news, however, we know tooth damage following trauma can present up to months later, so we will have to continue to monitor these teeth. The radiographs also confirmed that the external fixator broke off, rather than falling off, as we were able to see tips of the four pins embedded in the bone on the radiographs. As these are so deeply embedded in the bone, we will not be able to remove them without causing significant trauma, so the decision was made to leave these in place, which will likely not cause this bear any major problems in the future. We also collected blood on this bear to ensure that the infection in his jaw was not causing serious systemic inflammation, and fortunately, it was found to be within normal limits. The bear was also ear tagged while he was anesthetized – left ear green, right ear orange. Black Bear cub #18-2921 is doing well in the Center’s Large Mammal Isolation enclosure – and he has a new neighbor! Following her surgery on Friday, cub #18-2926 was moved into the connecting chute of the enclosure. Cub #18-2921 is in the left half of the enclosure [a larger space]; the two bears can smell and see each other, but won’t be able to have direct access since the female cub is being cage-rested. Cub #18-2921 has been eating well despite his “headgear” that is stabilizing his fractured jaw. On October 16, Dr. Ernesto performed surgery on Black Bear cub #18-2921’s fractured jaw. The surgery took longer than expected, and Dr. Ernesto had to adjust his plan several times to be able to successfully stabilize the jaw. In the end, Dr. Ernesto opted for an external fixator on the bear’s mandible, which should hold the bone fragments in place as the jaw starts to heal. Dr. Ernesto was also able to more closely evaluate the bear’s teeth; it appears that the roots of the permanent lower canines are affected, and one of the bear’s pre-molars is fractured. Radiographs will be repeated every three weeks to closely monitor the jaw, as well as any tooth issues – tooth death and injuries can take weeks to make themselves known. The bear was moved to the Center’s Large Mammal Isolation enclosure to recover. On the morning of October 17, the team was pleased to find that the bear was alert and had eaten his very soft meal overnight.